The election is set to deliver a significant boost to Irish nationalism at the expense of unionists, RTE reports. Sinn Féin could come within a seat or two of the DUP, which held a 10 seat advantage in the previous Stormont government. The nearly 65 percent turnout was higher than first anticipated and the strongest since the vote that followed the 1998 Good Friday Agreement. Ulster Unionist leader Mike Nesbitt announced his resignation. Polling stations have closed across the six counties of Northern Ireland, and counting will take place throughout the day 3 March. Results should be completed by the following day. The Electoral Office for Northern Ireland has told media outlets that the turnout was higher than last May’s 55 percent participation rate. 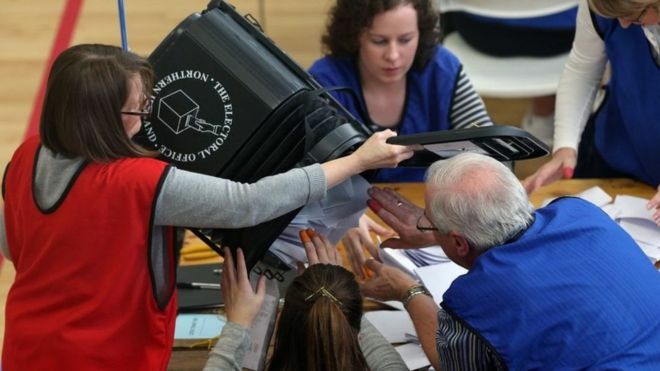 The BBC reported 80 percent turnout in new Sinn Féin leader Michelle O”Neill’s Mid Ulster constituency, and more than 75 percent in DUP leader Arlene Foster’s district of Fermanagh South Tyrone. Could these two women share power at Stormont? Or will there be a return to direct rule from London? Check back for updates, and I’ll wrap up the results by 5 March. This entry was posted in History, Northern Ireland and tagged Arlene Foster, Michelle O'Neill on March 2, 2017 by admin. A 40-year-old mother of two children has replaced an aging and ill former IRA commander as the new face of republican politics in Northern Ireland. Northern Ireland Assembly health minister Michelle O’Neill has been selected by Sinn Féin to lead the party in the province. The Mid Ulster representative takes over for Martin McGuinness, 66, who resigned earlier this month due to health problems and lingering questions about his unionist counterpart’s role in a troubled energy program. “I have no doubt that I am following in the footsteps of a political giant,” O’Neill said in a statement. The McGuinness resignation resulted in the assembly being dissolved and triggers fresh elections 2 March. 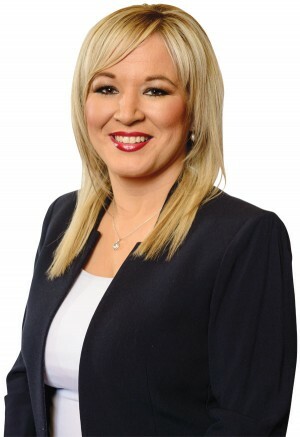 O’Neill has held elected office since 2005 and was first woman mayor of the Dungannon council area, according to a detailed bio on the party website. She lives in Clonoe, County Tyrone, about an hour west of Belfast. The political landscape continues to evolve in Northern Ireland. As The Guardian reported a few days before O’Neill’s selection, demographics are driving a lot of the change. The ratio of Protestants to Catholics is close to even, and more immigrants are living in the province. This entry was posted in Northern Ireland, Politics and tagged Brexit, County Tyrone, Martin McGuinness, Michelle O'Neill, Sinn Féin on January 24, 2017 by admin.